While I disagree ideologically with almost everything the Heritage Foundation stands for, it's refreshing to see that we both agree with the old adage that she who Pinterests drunkest, Pinterests best. Great example of Pinteresting drunk: the Heritage Foundation's 'Surprise Criminals' board. It makes no sense. It has nothing to do with conservative politics. It's fantastic. I get the impression that Surprise Criminals started as a sincere effort to gather stories of Americans jailed as the result of government overreach into property rights or gun rights or other pet issues to Heritage, but devolved into a collection of pictures of things like watermelons and puppies in cages. Fine by me. For more traditional, less drunk pinteresting, there's Sentiment, a collection of heartwarming photos of military families reuniting and patriotic dogs. EVERYONE LOVES PATRIOTIC DOGS. 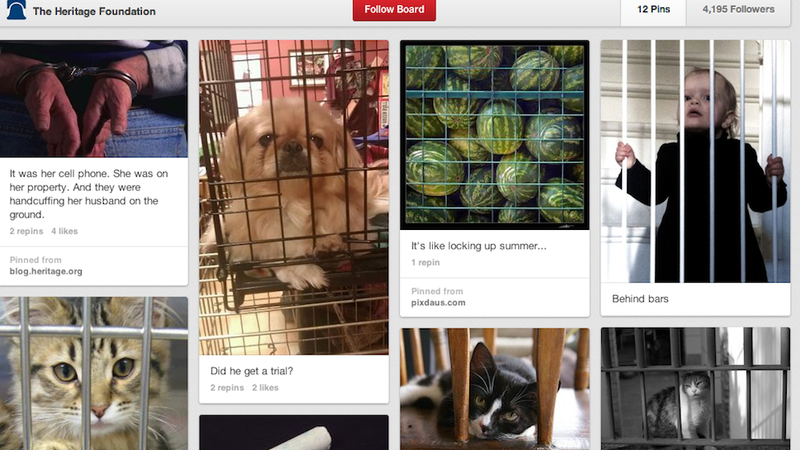 So take some time to peruse Heritage's delightfully cute/weird Pinterest page today. Besides, if we can't unite behind picture-heavy memes, then what hope does America have?